Cattle supplements and minerals are among the most important tools in your beef ranching toolbox. A pinch of salt, cobalt, copper, zinc, or selenium, or a little extra boost of protein or energy can trigger huge improvements in your herd's health, conception rates, and weight gains. You can even use cattle supplements to extend the length of your grazing season! So don't make the mistake of thinking that your cattle's mineral and supplement needs are met simply by tossing a salt block into your pastures. Take the time to design a custom mineral and supplement program - it could be the most profitable farming decision you make this year. In this article I'm going to show you how to get started. Just because grass is green and growing doesn't mean it always has the same amount of minerals, vitamins or trace minerals in it. These levels change, often quite drastically, from month to month. And the protein and energy content of the grass is just as variable. Temperature, rainfall, grass maturity, and soil fertility are just a few of the factors that affect the protein and energy content of the grass during the growing season. And the grass reserves you rely on during the dry season or winter are even more variable, depending on the maturity and quality of the grass as it goes dormant, temperature, rainfall, and how resistant the grass is to nutrient leaching. It's not just the grass quality that is constantly changing. Your cows' nutritional needs are also not constant. They change from month to month as your cattle reach different stages of pregnancy or lactation, before and after weaning, and during different stages of their growth from birth to adulthood. Given all these constantly changing variables, it's hardly surprising that your cattle's needs don't always match up with what's available from the grass. Optimal nutrition means making up for the differences with cattle supplements. Fixing a mineral deficiency could dramatically boost weight gains or improve cattle health. A little extra protein or energy at the right time could translate into much higher weaning weights. And your herd's conception rates could get a significant boost simply by providing supplements at key times to manage the body fat reserves of your breeding stock so they never get too thin and have optimal body fat levels at calving time. And there is another often-overlooked reason to design a custom cattle supplement program: to extend the length of the grazing season. Grass doesn't suddenly become inedible the moment the growing season ends. Quality slowly erodes, bit by bit, until it no longer provides everything that cattle need to stay healthy and maintain body fat levels within safe limits. Most farmers opt to switch to hay or silage when grass reaches that point. But they are missing out on a huge opportunity to significantly extend their grazing season without spending a lot of extra money. A little bit of extra protein or energy, or a few extra minerals provided along with the day's pasture slice may be all that's needed to keep your cattle grazing on cheap stockpiled winter pastures while the neighbors' cows are already plowing through mountains of expensive hay and silage. Your supplement program is the secret that will allow your cattle to keep grazing safely as grass quality gradually deteriorates during the winter or dry season. Spending a few dollars a day on a custom mineral program means you can optimize cattle nutrition using a combination of cheap pasture and a small amount of supplements, instead of spending thousands of dollars making, storing, and feeding expensive hay and silage. This is the hardest step, because not all feed stores have a livestock nutritionist on staff who can do the calculations needed to design a custom supplement program. Pre-formulated products that are not based on forage analyses of your pastures aren't going to cut it. And you're also not looking for a mixed feed ration to replace your pasture grazing program. All you need is the right mix of minerals and supplements to support your grazing program throughout the year. If your local feed store doesn't offer this service, you can also use a feed store from outside your local community. You won't be handling large volumes of minerals and supplements, so the feed store can send you pallets of supplements by courier. A livestock nutritionist that can calculate a mineral and supplement mix based on monthly forage analyses of your pastures. This means the feed store also either needs to have a forage analysis lab on site or they must have a third-party laboratory that they work with where you can sent your samples for analysis. The lab must be capable of testing not only the protein and energy content of your grass, but also a wide range of minerals and trace minerals, such as copper, selenium, zinc, iodine, iron, etc. Your cows should reach a body condition score of around 7 on the 9-point Body Condition Score scale (approximately 31% body fat) BEFORE they calve so that you can maximize conception rates during the breeding season. You can learn more about this concept in this article. But you aren't trying to keep them fat all year. Body fat can fluctuate within a safe range, gradually sinking to as low as a body condition of 4.5 or 5 (approximately 20% body fat) while grass quality is poor. But body fat should never fall below a score of 4. A body condition of 4 is already considered borderline too thin and will begin to have long-lasting effects on the cow's health and fertility, even if they regain a body condition of 7 by the time calving starts! Here's a simple diagram that summarizes this strategy. The chart covers approximately 18 months (2 calving seasons). The brown "wave" represents how fat levels rise through the growng season and then gradually decline during the dry season or winter. Calving is timed to happen when cows are at their fattest, and weaning is timed to slow weight loss to prevent cows losing too much body fat. The nutrition strategy: fatten cows on pasture before calving starts, continue grazing after the growing season ends, and use nutrition supplements to prevent body fat levels from dropping too low. You should take monthly forage analyses every single month for at least an entire year so you can map out how minerals, protein, and calories in the grass change over the course of the year. That doesn't mean you should wait an entire year to start your custom supplement program - your livestock nutritionist will simply need to keep readjusting their calculations according to the growing data you collect. You only need to take a single forage sample per month. The sample needs to represent whatever the cows are eating on the day you collect the sample. You don’t need samples for every pasture since you are simply trying to track how grass quality changes during the seasons. Your forage samples should mimic your cattle's diet. So before you collect your samples, sit in the pasture with your cows for a few minutes and watch what they are eating so you can put a similar mix into the sample bag. If they are avoiding certain plants, don't include those in your sample. Only include the bits of the plants they are eating - if they are leaving a 12 inch stubble, break off your grass at the same height. If you currently feed hay for part of the year, you'll want to sample both the hay AND continue sampling the grass left over in your pastures (even if they are covered by snow). This gives your livestock nutritionist the necessary data so that you can make adjustments to your supplement program in the future if you learn how to use stockpiled pastures to extend your grazing season into the winter months (or dry season, for those readers living in tropical climates). Collect your samples on the same day each month, such as the first Monday of every month so that your data is consistent. Consistency is key to mapping out how pasture quality changes over time. So unless your house is on fire, don't miss your collection date! Use clean latex gloves and a new, clean plastic bag to collect samples. Salt from sweaty hands will completely ruin your results because it will mess up analyses levels. Crumbs or dirt in a dirty bag will also degrade the accuracy of the lab results. Calving date - the ideal calving date for your herd should give your cows enough time to fatten up on fresh growing pasture before calving starts. In other words, calving should begin about 4 to 6 weeks after the growing season starts, which should be enough time for cows to regain a body condition score of 7 if they dropped as low as a body condition score of 5 during the winter or dry season. However, your nutritionist's calculations will be able to refine that date based on your forage analyses, so start with an approximate date and then make some adjustments based on your livestock nutritionist's calculations. Weaning date - again, start with an approximate weaning date. Weaning is a powerful way to reduce your cows' nutritional needs, so once you have your monthly forage analyses your nutritionist will be able to tell you the most cost-effective weaning date. If cows are fat, it is cheaper to let cows continue to provide milk for the calves as long as possible. But when cows start to get thin, it is cheaper to wean the calves and then supplement both cows and calves separately than to try to continue to sustain milk production. So weaning date is not just a date on a calendar, it is a powerful tool to optimize cattle nutrition. The size of your cows - body size affects your cows' nutrition requirements. So the next time your cattle are in the corral, record the hip height measurements and the approximate age of all your cattle. Hip measurement instructions are found here. Your livestock nutritionist will use this combination of hip heights and ages to calculate your cows' nutritional requirements. (Because hip height changes with age, your livestock nutritionist will use the combination of height and age to assign a frame score to your herd from 1 to 9. Here's an example of a frame score look-up table used for these calculations.) You will only need to measure your cattle herd once unless you change breeds or make drastic changes to your herd genetics. However, it is worth re-measuring your herd every few years to verify that your average herd size hasn't gradually changed without you noticing. What's the best way to supplement cattle on pasture? The feed store is also going to ask you how you want to feed your minerals and supplements. A free-choice loose mineral/salt mixture is the best. The salt in the mineral mix acts as a way of limiting supplement intake. If you stir a small amount of protein or energy supplements into the mineral/salt mix, the salt prevents the cattle from gorging on it. Each cow naturally will get the right amount of supplements along with her salt intake. By contrast, trying to provide separate protein or energy supplements (like a buffet) is a losing battle. Without salt to regulate how much each cow eats, the dominant cows will eat all the protein and energy pellets while the less dominant cows in the hierarchy won't get any. The feed store can provide minerals in pre-mixed bags based on the calculations of your forage analyses. Salt should come in separate bags so you can change the ratio of salt to minerals as needed in your free-choice mineral feeder (increase salt to reduce mineral consumption, decrease the salt ratio to increase mineral consumption). The protein or energy pellets (i.e. alfalfa pellets, wheat middlings, soybean hulls, canola meal, etc) should also come in separate bags, which you can add to the salt mix as required. In months when your cows need extra protein or energy supplements, you simply stir the supplements into the mineral mix in the right proportions (by volume) according to your nutritionist's instructions (i.e. 1 bag minerals + 1 bag salt + 1/2 bag protein supplements). When the mineral feeder is almost empty, add more. The salt keeps the cattle from overeating. A loose mineral mix requires a mobile mineral feeder that follows your herd through the pasture rotation. A freshly refilled mobile mineral feeder supporting a herd that is grazing the previous year's leftover grass prior to the start of the fresh growing season. A couple of mobile mineral feeders accompanying a herd during a winter pasture rotation. 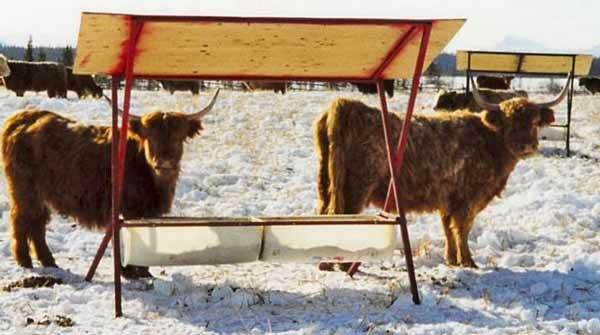 The mobile mineral feeders shown in the previous two photos are ideal for any pasture rotation. During each pasture move, you simply tow the feeder to the next pasture slice with your ATV. The cows quickly learn to associate the moving mineral feeder as the cue that they are about to get fresh grass. This teaches them not to mob your ATV every time you drive through the field. In my book I also explain how to use the mobile mineral feeder as a "follow-me" cue so you can train your cattle to follow you where you want them to go, even through complex gates and across long distances. Empty plastic barrels that are cut in half make great mineral feeders when bolted onto a metal frame. A roof is useful to keep some of the rain out. A sloped roof on both sides is better in windy areas so the feeder doesn't get blown over. The skids should be made of wood so the cattle don't hurt their feet on sharp metal edges. I built my first mineral feeders with metal skids, but noticed a sharp increase in foot-rot in the cattle herd, which disappeared again when we switched to wooden skids. The wooden skids are also easier to break loose if they freeze to the ground during the winter grazing season. Monitor cattle body condition to verify if your supplements are on track. Your nutritionist’s calculations (based on your forage analyses) give you a theoretical idea of how you expect your cows' body fat levels to change from month to month. Your supplement program is meant to manage those changes so your cows' body fat reserves always stay within safe levels. But theory and reality don't always match. So you also have to continuously monitor body condition scores out on pasture to make sure that the cows don’t lose weight faster than expected and don’t get thinner than expected. If either occurs, you need to intervene (increase supplements, feed hay, wean early, etc. ), otherwise you may be risking your cows' health and fertility. While it’s not hard to see whether cows are getting thinner or fatter, body condition scores provide you with a standardized measurement system so you have a consistent tool to estimate body fat levels out on pasture. To use body condition scores successfully, you need to “calibrate your eye” by training yourself to recognize how different body fat levels look. My article about body condition scores teaches you how to use this simple but powerful tool. I hope this overview of cattle supplementation will help you get started. Your cattle health, conception rates, weight gains, and farm profitability will all thank you for making the effort to set up a custom cattle supplement program. 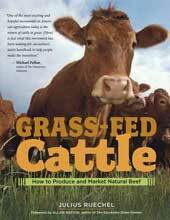 To learn more low-cost cattle farming strategies like the strategy covered in this article, check out my book: Grass Fed Cattle. If you'd like to be notified when I release future cattle farming articles, sign up for my email notifications or follow me on Facebook or Twitter.